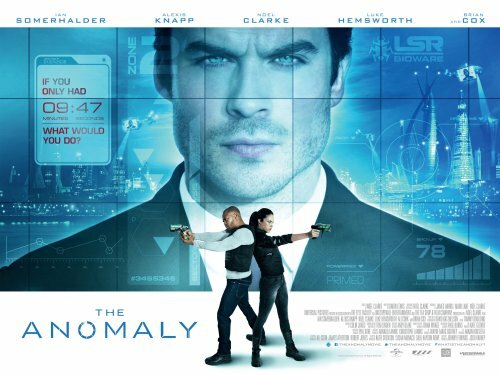 Noel Clarke has now changed tack with his latest film, The Anomaly. Gone are the dramas of growing up that we saw in Kidulthood and its sequel, Adulthood. This time its a sci-fi thriller. This film will make his second outing as a director since Adulthood. Not only does he direct the film, he acts, co-produced as well as co-writing the film. The trailer doesn’t make the film look like anything new. I would describe it as a cross between Duncan Jones’ second film, Source Code and 2011’s In Time with a little bit of Looper thrown in for good measure. Even the synopsis sounds similar to Source Code. On the plus side, it, if the trailer has anything to go by, is well directed and acted. The thing that lets it down is the, seeming, lack of imagination as there there is a similar sounding film also coming out in 2014 staring Tom Cruise. There must be something that makes this different than taking the three afore mentioned films, throwing them in a blender & hoping for the best. Even the poster is wrong. Why Have Noel and the female lead on the poster. It’s more stunning with just Luke Hemsworth on it. They draw your eye away from the tag line and name of the film. All you can see is the two, in a bad pose, with guns drawn. I could go on about who is the lead as the poster seems to indicate, by name, it’s people who have had staring roles in other films. The press release that accompanies the synopsis says “Luke Hemsworth in his first lead feature film role“. We get that from the poster but looking at the list of names at the top, he’s listed 4th. Traumatised ex-soldier Ryan wakes up in the back of a van, alongside a kidnapped boy. Ryan helps him escape but when he finds a mask in his pocket he comes to an appalling realisation… But there’s no time to act – after nine minutes and forty seven seconds of consciousness it all goes black. What does this have to do with Ryan’s past as a patient at the experimental Medical Unit? Ryan has a lot of questions, and very little time to find any answers.